Continuing with their artist curated reggae and dub compilation series (see: DJ Spooky & Jonny Greenwood, previously) Trojan Records invited Super Furry Animal’s bassist Guto Pryce to raid their vaults. 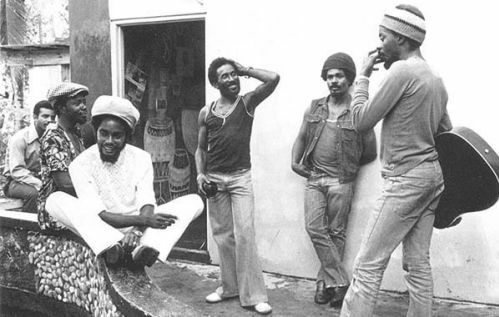 Pryce, in his selection, shows a keen ear for classic reggae, ska, dancehall, and of course, and not surprisngly, dub. Trojan waxes: “(this is) a barnstorming romp through the Trojan back catalogue adding to the label’s 40th anniversary celebrations…Horace Andy, U-Roy, Lee Perry and Bob Marley are all in full effect.” Not to mention Tenor Saw’s “Ring The Alarm,” a long time Drunkard go-to DJ jam. In related news: UK based MOJO magazine has nominated Jonny Greenwood’s (Radiohead) Trojan project Jonny Greenwood Is The Controller in the reader voted best compilation category for the MOJO Honours 2007. More details can be found HERE. I love these Trojan guest spots…excellent stuff. Good stuff – the Johnny Greenwood album was excellent.